A fractured neck of femur (NOF) is a common orthopaedic presentation. Over 65,000 hip fractures each year are recorded in the UK alone, and they are becoming increasingly frequent due to an aging population; with associated lengthy hospital stays and an estimated cost of over £7500 per fracture. The mortality of a femoral neck fracture is up to 30% at one year, in part due to the fracture, and also due to the frailty of the patient population. Consequently, these fractures require specialist care to reduce mortality and morbidity. In this article, we will look at the classification, anatomy, clinical and radiological features, and management of neck of femur fractures. High energy injuries – such as a road traffic collision, affecting the ipsilateral side. 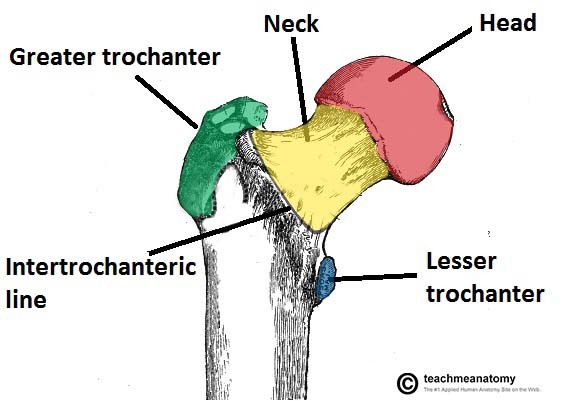 The neck of the femur is around 130 degrees to the shaft (also anteverted by roughly 10 degrees), with the femoral head sitting within the acetabulum. The femoral head’s blood supply is primarily uni-directional, most arriving from the medial femoral circumflex artery* (arising from the deep femoral artery). The medial femoral circumflex artery lies directly on the femoral neck and is thus vulnerable to damage in a fracture. *There is supply in the early days of life from the ligamentum arteriosum within the ligamentum teres, however dramatically reduces in size in later life, and also minor contributions from collateral arteries. A patient will typically present with a history of a recent fall or trauma, with significant pain (in the groin, over the hip, in the thigh, or the knee) and an inability to weight bear. On examination, the leg is characteristically shortened and externally rotated (due to the pull of the short external rotators, Fig. 2), with pain on pin-rolling the leg and axial loading. The patient will be unable to straight leg raise. Fortunately, distal neurovascular deficits are rare in isolated neck of femur fractures. However, a full neurovascular examination of the limb is essential, with any deficits urgently acted on accordingly. Fractures of the pelvis (especially pubic ramus fractures), acetabulum, femoral head and femoral diaphysis all need to be considered. Pathological fractures should be considered if there is not a significant history of trauma. Initial radiographic imaging should include antero-posterior (AP) and lateral views of the affected hip, as well as an AP pelvis (useful to assess the contralateral normal hip for pre-operative planning and templating)*. Obtain full length femoral views if there is suspicion of a pathological fracture. Basic routine blood tests, including FBC, U&Es, and coagulation screen, are required alongside a Group and Save; if a long lie time could have occurred, a creatinine kinase level would be recommended to assess for any rhabdomyolysis. A urine dip, chest radiograph (CXR), and ECG are all useful in complete assessment of the older patient group, especially for pre-operative assessment and peri-operative management. *If there remains clinical equipoise about the diagnosis, repeat plain films whilst manually applying traction to the affected leg or (more commonly) an MRI hip may be warranted. Initial management of a neck of femur fracture should consist of an A to E approach to stabilise the patient (as for all trauma cases) – in particular as they are often an unwell and frail group of patients. Ensure adequate analgesia is provided, as well as early orthopaedic involvement. There may have been a precipitating factor (do not assume all are due to UTI-related confusion! ), so a thorough assessment of potential underlying causes and contributing conditions is essential. Definitive management is surgical, specific procedures depending on the type of fracture sustained. Non-operative conservative management is very rarely recommended, as the benefits of surgical intervention nearly always outweigh the potential conservative management. Intertrochanteric and Basocervical* Dynamic hip screw Consists of a lag screw into the neck, a sideplate, and cortical screws. The lag screw is able to slide through the sideplate, allowing for compression and primary healing of the bone. *Displaced intra-capsular fractures in normally well and active elderly patients with high performance status can be treated with Total Hip Replacement, replacing both the femoral head and neck (via a femoral component) and the acetabulum (via an acetabular cup). Immediate post-operative complications include pain, bleeding, leg-length discrepancies, and potential neurovascular damage, all of which should be consented for pre-operarively. Post-operatively, NOF patients should be managed jointly under the care of the ortho-geriatricians, ensuring to optimise the patients’ medical management. Best outcomes are achieved with early rehabilitation, through engagement with physiotherapists and occupational therapists. 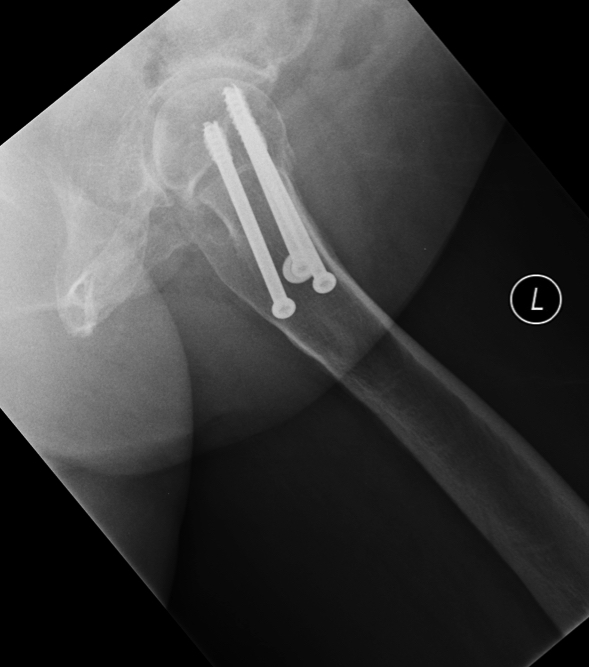 Long term complications following repair include joint dislocation, aseptic loosening, and peri-prosthetic fracture. The mortality following a femoral neck fracture is up to 30% at one year. Neck of femur fractures are associated with a high one year mortality and the patient cohort are often elderly and unwell with multiple comorbidities. They will present as an acutely painful hip that is shortened and externally rotated. Treatment of neck of femur fracture is primarily surgical. The specific procedure required will depend on the classification of the fracture. Ensure early assessment by ortho-geriatricians alongside physiotherapists and occupational therapists. Which blood vessel represents the greatest arterial supply to the hip joint? What is the correct description of a Garden III NOF? What is the most appropriate surgical intervention for a subtrochanteric NOF?